Life Success hypnosis recording because life is full of surprises and even more opportunities than we can dream of. They are all waiting for us to take them up. Yet, many people become so fearful and inhibited by past experiences that even the thought of doing something new makes them nervous. Success is about focussing on what you want, on what you desire and then committing yourself to achieve it. So what does success really mean to you? Ask twenty different people and you will probably get twenty different answers. Until you crack what success means to you, how will you know when you do in fact, succeed. Motivation comes through knowing where you want to be, and where you want to get to. When faced with the question above, you may be tempted to rattle off a quick response and probably someone else’s idea of success and not your own. It may be what you think your parents, friends or relatives want either for you or what they judge it to be success. Don’t fall for this trap! Your success should be what you judge it to be and not based on anyone else’s ideas. 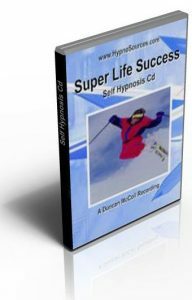 This eye opening Super Life Success Hypnosis cd help you discover yourself and what success means to you.